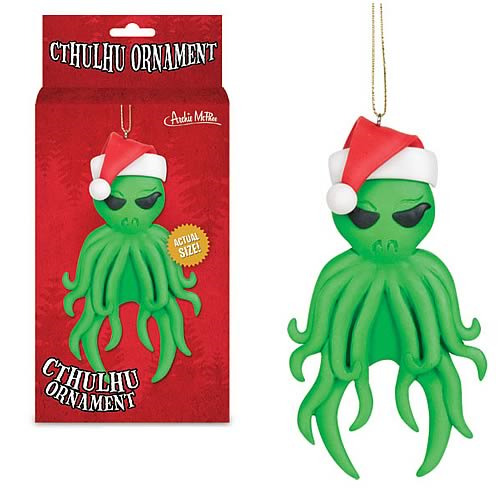 Shopping for Cthulhu Holiday Ornaments? Cthulhu with a Santa hat! A 4 3/4-inches tall ornament. Sing "Destroy the World" with Cthulhu! Instead of, "Joy to the world," the Cthulhu Holiday Ornament says, "Destroy the world." The representation of chaos and destruction from H.P. Lovecraft's stories is 4 3/4-inches tall, made of plasticized clay-dough and done up with a delightful festive Santa hat. Putting Cthulhu on your tree balances out all those happy ornaments you get from the mall. The Cthulhu Holiday Ornament comes with a string for hanging. Decorate your beloved Christmas tree in H.P. Lovecraft style!